Dota 6.60 New Items Layout - Do you like it? As IceFrog stated on his latest post, we will get new items layout on Dota 6.60. At the first glance, i feel really weird about it. Well, no wonder, i've been play Dota about 3 years and already get attached to the current items layout. But i guess it's just a matter of preference. After some game maybe i will get used with it ^^ Back on the topic. I really like the Orb shop idea (Enchanted Artifacs). It would make us easier to know which items is contain orb effect and not mixed them up (most of the newcomer confused with it). Overall, this new items layout is more intuitive, especially for the new player. But that's just my opinion, what about you? Do you like the new layout? Talisman of Evasion, Poor Man's Shield,force staff, Magic Wand, and The Leveler should be the only ones on the list because the shops he is showing is only recipe shops. That's only 5 new recipes. 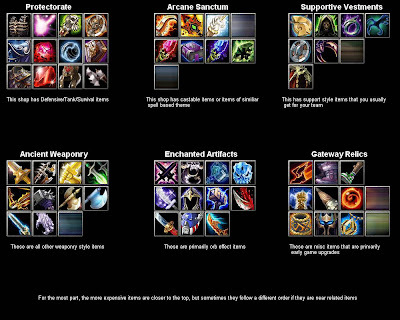 If you look in beta 46, quelling blade, and talisman of evasion are regular items so they wouldn't be on this chart. Stout shield and magic stick have new icons, but they are not recipes either so they wouldn't be on this list either. That means in the current beta there is 1 new recipe that is not in beta 46. I wonder what it is! EDIT: Actualy, talisman of evasion isn't a recipe either, and i forgot to mention pipe of insight isnt either. That means that only 4 new recipes would be on the list. There are 6 blurred out so that means we have 2 new recipes that aren't in beta 46. Could these be the new items? In Arcane Sanctum - Force Staff, ??? In Gateway Relics - Magic Wand, ??? So we're missing two recipes. Curious. You can see that the new PIPE item is in Supportive Vestments, so that means it is now a recipe instead of a stand alone item. I can see magic wand and poor mans sheild in gateway relics, and the Leveler in Ancient weaponry. The 2 left are in arcane sanctum. It would have to be force staff cuz its a castable item. But the blurriness doesnt fit the current icon for force staff. And i have no idea what the other one in arcan sanctum is. What are the new CASTABLE items in beta 46???? Poor Mans shield is not a team item, it would go in the gateway relics. Its the one next to pers. Pipe of insight is in supportive vestments because it can be used to cast on allies or yourself to make them unattackable. That means its a support item. So now Pipe of Insight must be a recipe, and we're missing one more in Arcane Sanctum. @Anonymous: Beta 46 had the exact same items as Beta 45, except with Quelling Blade costing 200g instead of 300g. The main addition to Beta 46 is Rune Sounds (increased map size by 0.15MB). OMG! That's exactly what I e-mailed to IceFrog! Though he added gateway relics and arcane sanctum. Would he credit me? LOL! I hope so. I dont see anything that looks like force staff. Did force staff get removed, changed, or new icon? I'm guessing it just got a new icon. It's been in there since Beta 21. Would be a shame if Ice removed it, it's a very fun item. Why isnt manta in the orb shop(Enchanted)? - Manta in 6.60 beta 45 onwards is not an orb effect item anymore. It was changed to Yasha buff + illusion active skill. I think this new layout is pretty neat. It'll take us a while to get used to it however. oh yeah!!! but it just takes too long who has an idea when it will be released? One month is nothing, not for something of this size. To be frank, I would rather he do all of this in parts. Too many changes in one go. Most of the first games will be chaotic. Let's wait and see what big and amazing map he would release :). I think he should move Lothar somewhere else, or there will be no room for future protective item. You first need to ask , when is version 1.24 coming up? Icefrog would probably only release 6.60 when Warcraft 1.24 patch comes out since it would be easy to spread a virus otherwise. till the new Dota Version comes out. Just enter a name and get your own Brute. That is the force staff icon blurred out next above magic wand's in the gateway relics shop. Maybe he hasn't moved it yet or that's where it will be. It looks like poor man's shield has been removed to me. I don't think poor man's shield has been removed, its item bases were changed so that the item would become viable, removing it would be strange. new items are nice and good, but we dont want too much. Cuz than we got to keep choosing. but i thinkk they should leave the items alone and upgrade the gameplay to a new LEVEL--- its always the same old boring creeps and towers. Arcane Sanctum (top-right): Force Staff. It's already there in beta 54. Arcane Sanctum (bottom-left): Ghost Staff. The activated effect alone is awkward enough, but it also gives 6 to all stats. This makes it a very obvious recipe item. Supportive Vestments: Khadgar's Pipe of Insight. It's already there in beta 54. Ancient Weaponry: I would only imagine a remake of The Leveler, without the possibility of stacking bonus damage to buildings. Gateway Relics (second row): Poor Man's Shield. Gateway Relics (third row): Magic Wand.